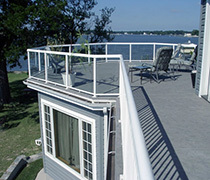 Durarail Aluminum Railings are maintenance free and made with a polyester material (TGIC) which is UV resistant and will not peel, flake or blister as it ages. If desired, a cut polish can be used to buff these products back to like new condition. Durarail products are manufactured in North America by a company called Excell Railing Systems Ltd.